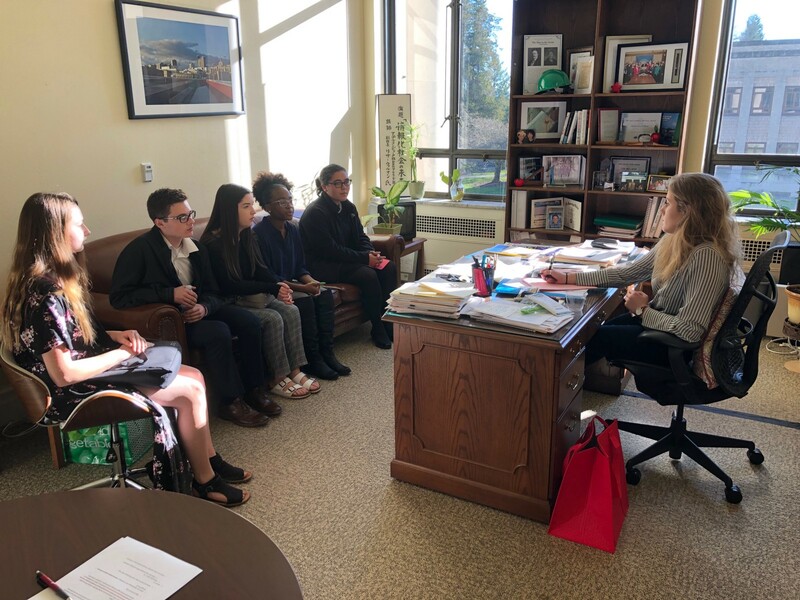 Freshmen in Bethel High School’s Cambridge Program visited Olympia last week to lobby lawmakers. Anyone who bemoans the lack of civic engagement in today’s youth has obviously never met the students in Bethel High School’s Cambridge Program. Dozens of Cambridge students — all freshmen — piled into a bus last week with teacher Jim Sawatzki and headed to Olympia to lobby lawmakers on the issues they hold dear. For most students, a trip to the state capital would be little more than an excuse to have a fun day of sightseeing and meeting politicians. But Cambridge students aren’t like most students. The unique program, which is part of the prestigious University of Cambridge in England, is one of the most demanding and rigorous college preparatory programs in the world. Students Braeden Young, Jonah Wrye, and Blake Jordan spoke to state leaders about changing drug laws. For these young men and women, the field trip was all business. 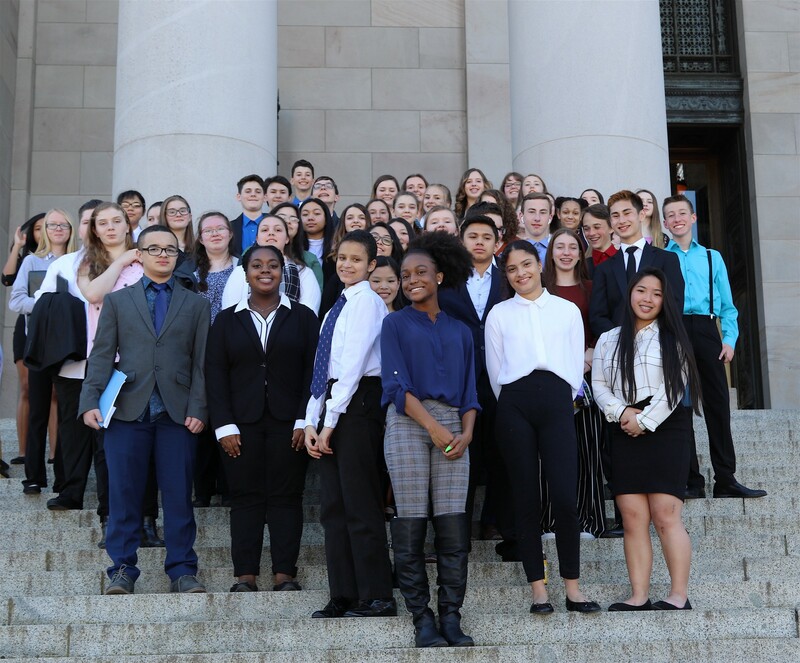 The students had already picked topics they were passionate about— from lowering the supermajority requirement on school bonds to providing more treatment for opioid users — and had written succinct “white papers” to present to legislators and their aides. “Everyone has a voice, and we need to use them. Going to Olympia and speaking to these people is the best way to make sure you’re represented,” said student Paige Gregory. 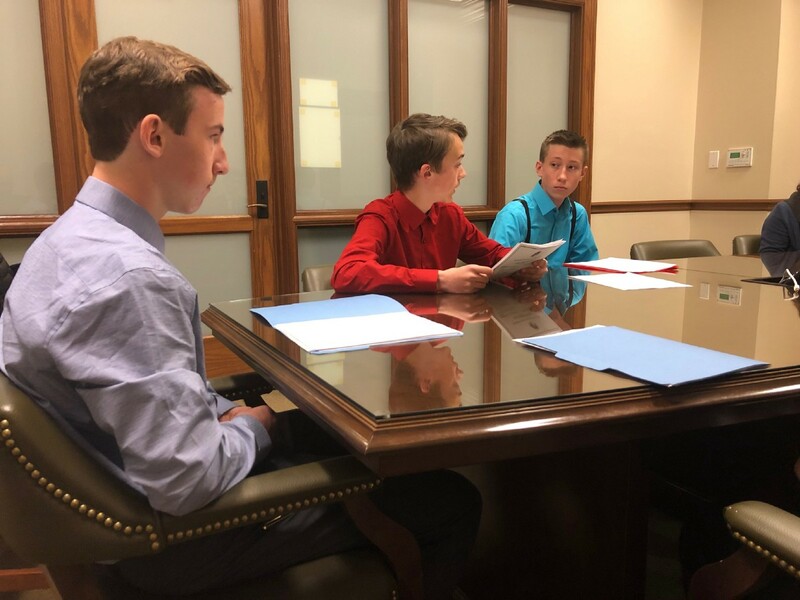 Working in small groups, the students attended pre-arranged meetings with various lawmakers and legislative aides. In between those formal meetings, they did informal “drop-in” visits with any lawmakers they could find. David Cook and his group spoke to state leaders about making foreign language study part of the state’s Common Core requirements. He argued that bilingual children have increased test scores, faster learning capabilities, and an increased understanding and acceptance of other cultures. It’s an issue Cook truly believes in, and he says this field trip was just the first step in a long journey to change the laws. “I plan on coming back to lobby for it year after year, because this is a very important topic to me. I think it could majorly benefit Washington, as well as America,” he said. The students understand that the mechanism for changing laws can work at a glacial pace, but even if it takes years, they’re committed to doing their part to make the state a better place. “Overall, I felt that even though we’re walking in here as students — as kids — we’ve generally been accepted and this does allow us to feel like real citizens who are actively helping their community and putting new ideas out there and striving for the future,” said student Jonah Wrye. Learn more about the Cambridge Program here. Helping kids learn is the driving force behind all we do in the Bethel School District.